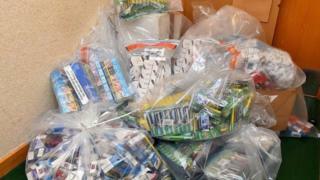 Almost 30,000 cigarettes and 20 kilos of tobacco have been seized in Londonderry in police raids targeting the INLA. Police and customs officers searched 11 shops in Derry on Monday. Officers also seized other counterfeit goods and mobile phones during the searches. Det Insp Tom McClure said the operation was part of the PSNI's commitment to "tackling the criminality associated with paramilitarism." "The INLA in Derry/Londonderry use brutality, threats and fear to exert control and behind the scenes are involved in a wide range of criminal money-making 'rackets' to line their own pockets," he said. He said retailers who stock illicit cigarettes should "think carefully about the potential implications upon conviction". "They and customers who knowingly purchase illicit cigarettes should be aware that they may be indirectly funding INLA terrorism and criminality which brings harm to local communities, for their own selfish gains," he added. A 65-year-old man was arrested in the Galliagh area of the city on suspicion of fraudulent evasion of excise duty in relation to 10,000 of the seized cigarettes and more than 14 kilos of tobacco. A search was carried out at a property following the arrest and a five figure sum of money was recovered as suspected proceeds of crime. Steve Tracey of HMRC said those involved in the sale of illegal cigarettes are "stealing from the taxpayer, robbing public services and undermining legitimate, honest traders." In December police and customs officers carried out similar searches in Derry and Strabane seizing 36,000 cigarettes and 5 kilos of tobacco.